Entrepreneurial and customer-obsessed, Lightspeed has become a leader in the realm of wearable technology for pilots by operating with a simple strategy: know your customer well and remain committed to relentless product evolution that expands performance to the edge of technological possibilities. This approach allowed Lightspeed to enter the aviation headset market already the innovation leader and allows us to set the standard for what is possible in the categories in which we compete. It's also a big part of why Lightspeed enjoys tremendous brand loyalty and is a company respected around the globe for its expertise and integrity. 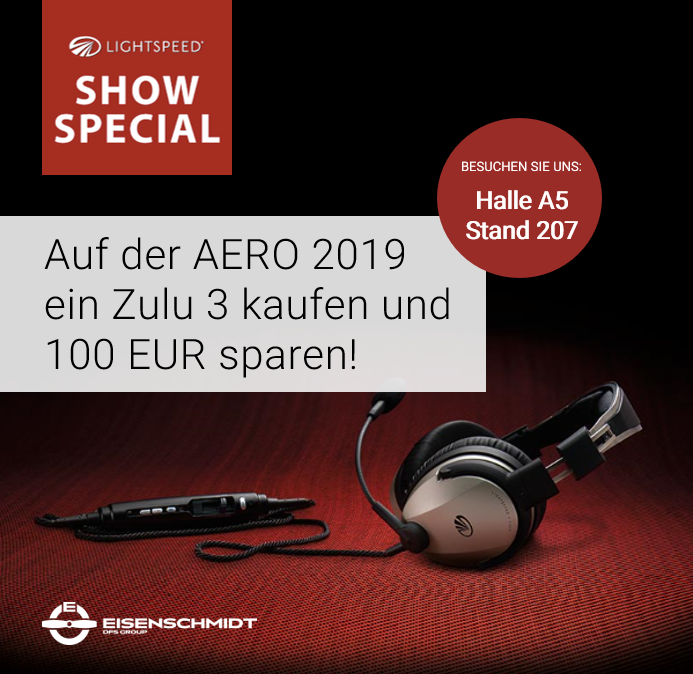 Wer im obigen Zeitraum ein Lightspeed Zulu 3 ANR-Headset bei uns auf der AERO (Halle A5, Stand 207) erwirbt, erhält einen Rabatt in Höhe von 100,00 EUR! Original Lightspeed Kopfpolster (Standard-Version) für die Zulu Serie.